Safe Helpline staff member, 24/7. DSN users can call Safe Helpline by dialing 877-995-5247. For those unable to call toll-free or DSN, call 202-540-5962. Are Safe Helpline telephone calls safe? We know that for many survivors reaching out after sexual assault can be scary and overwhelming, and you may be concerned about who might find out. Because of this, we have taken many steps to ensure that the Safe Helpline Telephone Helpline is a safe, secure, confidential place for survivors of sexual assault to receive support. We don’t record phone calls. Telephone sessions are not recorded, transcribed, or stored by Safe Helpline at any time. You can remain anonymous. Safe Helpline staff will not ask you for any personally identifiable information (PII). We do not need to know who you are to support you. We will not share any information you provide during a call with the Department of Defense or your chain of command. However, if you choose to receive Follow-up Support Services we may ask for limited PII, such as a phone number. Follow-up Support is an optional resource that provides survivors who have not yet reported their sexual assault to a military authority to receive a follow-up call from Safe Helpline. The check-in allows you to connect back with Safe Helpline staff, review resources provided during the original contact, and ask any additional questions. Follow-up Support is entirely optional and staff will never ask for PII if you do not want to receive a follow-up call. To learn more, review the info-paper here. In addition, per Executive Order 13696, communications between a victim and Safe Helpline staff for the purpose of receiving advice or support assistance is privileged information in cases arising under the Uniform Code of Military Justice. This means that you may refuse to disclose information shared with Safe Helpline staff and may prevent staff from sharing the information without your consent. Certain exceptions to this privilege may apply, but Safe Helpline staff will always seek legal advice when determining if an exception applies. No exception has ever been requested or granted in the history of the Safe Helpline. How can Safe Helpline help me? The Telephone Helpline can assist you whether you have recently experienced sexual assault or if it occurred long ago. Safe Helpline staff will listen to your needs and concerns and discuss your long and short-term safety, resources, and options. Perhaps most importantly, trained staff will be there to support you and let you know that you are not alone. SARCs/SAPR VAs, Chaplain, SVC/VLC, medical/mental health care services, Veteran’s Suicide Prevention Lifeline, local civilian sexual assault service providers and many others. Safe Helpline staff can answer questions to help you decide if any of these options are right for you. We will never transfer you unless you make a request. 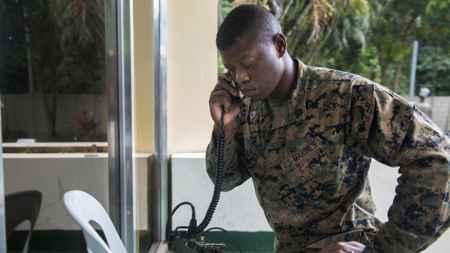 We can also provide you with phone numbers to contact your local military and civilian resources. Learn more about what local resources are available here. Anyone affected by sexual assault whether it happened to you or someone you care about can find support and information by talking with a trained Safe Helpline staff member. You can also visit chat.safehelpline.org to receive support via a confidential online chat, or click here to learn more about Safe Helpline’s other services. It can be difficult to talk about what happened. You can take comfort in knowing that Safe Helpline staff members are trained to meet the unique needs of survivors within the DoD community. Staff come from diverse backgrounds with different experiences but they all share a passion to help this community. To ensure quality support and care, Safe Helpline carefully vets, trains and monitors the performance of all staff members. In addition, each chat is overseen by a highly trained Safe Helpline Supervisor to ensure all users have a positive helpline experience. When you are done chatting with the staff member, you have the opportunity to leave anonymous feedback for Safe Helpline about your experience with the Telephone Helpline. We take these ratings and comments seriously. Your feedback helps us to continuously improve the Telephone Helpline and ensures our services best fit our users’ needs.